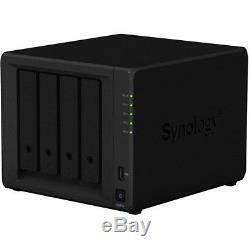 Synology DiskStation DS418 4-Bay Diskless NAS Network Attached Storage. Versatile NAS server for centralized file storage and real-time 4K H. Synology DS418 comes with a new 64-bit quad-core processor, delivering excellent data transfer speed, large storage volume management, and 10-bit 4K H.
265 video transcoding on the fly. Synchronize files across your devices Cloud Station Suite provides real-time data synchronization across all your devices, such as computers, mobile devices, and other Synology NAS whenever a file is modified. "Intelliversioning" keeps the most important file versions to better utilize storage space. Real-time collaboration on your private cloud. Office is a collaboration package combining the convenience and usability of public clouds with the data privacy and security guaranteed by private clouds. It allows you to work seamlessly together on documents and spreadsheets in a protected environment. 4K Multimedia Server Access and stream your favorite 4K content anywhere, anytime. DS418 supports 10-bit 4K H.
265 online transcoding via Video Station and DS video, allowing 4K videos to be converted and played on your computers, mobile devices, or other media players that don't support Ultra HD formats. Synology Hybrid RAID (SHR) technology. Storage management is easy with Synology Hybrid RAID (SHR) technology. SHR is an automated RAID management system allowing you to easily create and expand storage volumes and migrate RAID types without requiring details on RAID. SHR provides 1 to 2-disk redundancy to safeguard your data during drive failures. Cost-effective SHR maximizes the data capacity of your RAID when different sizes of HDDs are used. For novice users who have no technical background and still want to protect their data using RAID technology, a convenient installation wizard will guide you through all the steps during your first installation. While creating a volume, you can plan ahead and leave empty and unallocated space for future usage. Easy file access with QuickConnect. Access files on your Synology NAS over the Internet without the hassle of setting up port forwarding rules, DDNS, or other complicated network settings. QuickConnect allows you to connect via a simple customizable address e. Number of Hard Drives Supported. Number of Hard Drives Installed. Total Hard Drive Capacity Supported. Number of Solid State Drive Supported. Number of Solid State Drive Installed. Number of Total Expansion Bays. Number of 2.5"/3.5" Bays. 0, 1, 5, 6, 10, Basic, Hybrid RAID, JBOD. Total Number of USB Ports. Number of USB 3.0 Ports. Powerful 4-bay NAS for Home and Office Users. 1 x AC Power Adapter. 1 x AC Power Cord. 2 x RJ-45 LAN Cables. 1 x Quick Installation Guide. The item "Synology DiskStation DS418 4-Bay Diskless NAS Network Attached Storage" is in sale since Thursday, October 19, 2017. This item is in the category "Computers/Tablets & Networking\Drives, Storage & Blank Media\Hard Drives (HDD, SSD & NAS)\Network Attached Storage". The seller is "nothingbutsavings" and is located in LaGrange, OH. This item can be shipped to United States.